When typing interactive PowerShell commands, some cmdlets can be lengthy. Save yourself some time by making use of a PowerShell cmdlet’s Alias. A big PowerShell strength is its readability. Cmdlets follow a standard Verb-Noun format and avoid any acronyms that aren’t considered common knowledge. By simply looking at a command, you can quickly understand what it is intended to do. Readability is very important when you are creating a finished script that will be reviewed, used, and updated by others. 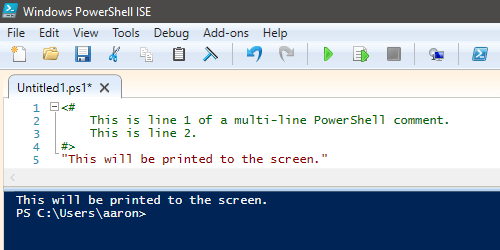 But what about when you are simply performing some interactive work from a PowerShell prompt? You can tab autocomplete a cmdlet, but that still requires a minimum amount of typing and you may need to tab through a few cmdlets before you get to the one you want. Save yourself some time and typing by using a cmdlet’s Alias. 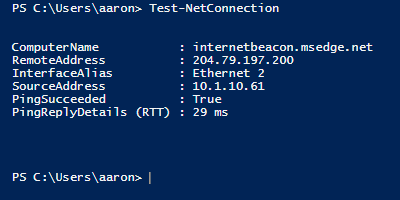 The first post in my PowerShell Beginner series “Daily Tasks, The PowerShell Way“, get started with PowerShell by replacing some classic but obsolete command line tools such as ping.exe, tracert.exe, and more by using Test-NetConnection. How to start using PowerShell? There is SO much one can do with PowerShell, often one of the questions is where to start. Why not with tasks you are likely to perform once if not multiple times daily? This is the first post in a PowerShell Beginner series aimed at highlighting tasks that you may currently be doing by GUI or old command line tools and showing how to do them the PowerShell way. PowerShell code tells you how, but the PowerShell comments tell you why. Here are the ways to comment your PowerShell and some accompanying best practices. Here is a scenario all too familar: You are heads down, writing an awesome script. Since you are writing it you know exactly how it works and why you made the design decisions you did. You are so clever! The code is so obvious that it pretty much explains itself to someone reading it. Now here’s how reality usually goes: A peer needs to make a change to your script. They wonder what the variable name $m represents. They try to trace flow of your script, constantly having to scan to find the function definition you created. Why did you create a special function for that? Couldn’t that be done with the <insert applicable cmdlet name here> cmdlet? What are the prerequisites for this code to run? Does it require a minimum version level of PowerShell? And the questions go on and on. Even if you as the author come back to review it months down the road, can you reliably remember the logic you used to design and write it?